During early November 2000, low lying areas throughout the U.K. were put on flood alert. Local Authorities, The Environment agency and latterly The British Government were forced to implement contingency plans to both prevent and alleviate the effects of flooding. 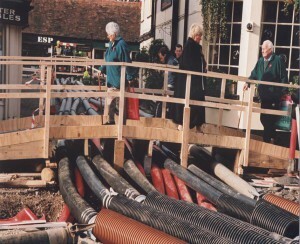 In West Sussex, the Local Authority decided that an attempt should be made to prevent the town of Chichester from flooding. This reaction was prompted by the fact that Chichester had suffered badly in 1994 from wide spread flooding throughout the area, which resulted in costs totaling many millions of pounds sterling. The financial implications of this occurring again, especially during the busy Christmas season, were unacceptable not only in the short term but also in the longer term with individuals and companies being deterred from investing in an area which demonstrated repeated disruption due to flooding. 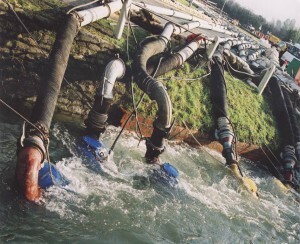 The alternative entailed setting up one of the largest “over-pumping” projects ever attempted in the U.K.
Hydrainer Pump Hire were selected to supply and supervise the installation of the pumping equipment, a project which entailed installing circa 50 pump sets, installed at strategic sites around the town mainly focused on removing flood water from the river Lavant and pumping it in stages to the sea, some 30 kilometres away. 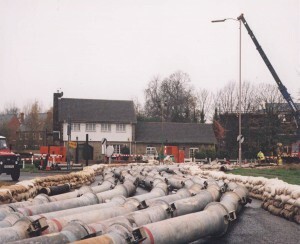 The operation required the provision of massive temporary pipelines, installed by the British army and local fire brigade under the supervision of Hydrainer personnel. The project lasted for five months, and was a total success. 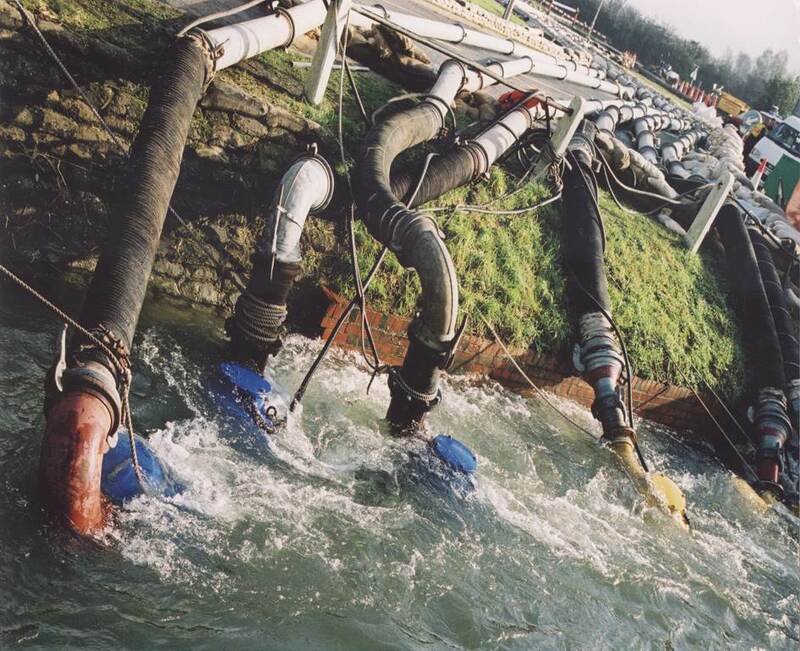 The total capacity of the pumps supplied by Hydrainer exceeded 800,000 m³/day. It has been estimated that this project was the largest of its type ever undertaken in Europe. No flooding occurred at any home or premises. The project was such a success that the British prime minister personally visited the site to congratulate all those involved in the operation. Miles of 10” and 12” pipes were laid through and around the town to divert the river, digging up roads where necessary. The locals happily put up with the temporary inconvenience, preferring it to the nine feet deep flooding they had in 1994.